BY PATRICK VEREL ON MARCH 25, 2019 for Fordham News. This past winter, a contingent of 11 Fordham undergraduate students joined thousands of visitors in a pilgrimage to Orlando, Florida. But unlike those who flocked to Disney World for vacation, the students had more on their mind than frolicking with Goofy or gallivanting about Cinderella’s castle. They had work to do. The group, which visited from January 6 to 11, was there for Applied Design Thinking, a new course being taught this semester by Janet DiLorenzo, Ed.D., clinical assistant professor of marketing at the Gabelli School of Business. “When we teach new product development, we talk about how you come up with ideas, then test the concept, test market it, and then launch it,” DiLorenzo said. Disney World is the ideal place to observe the concept, she said, because the Disney company is renowned for its human-centered approach, epitomized in the book One Little Spark! Mickey’s Ten Commandments and the Road to Imagineering (Disney Publishing, 2015), by Martin Sklar. Spaceship Earth, one of the rides at the Magic Kingdom that the students cast a critical eye. Sklar’s book was required reading for the class before their trip. When students arrived, one of their assignments was to apply commandments such as “Communicate with visual literacy” to an aspect of the Magic Kingdom. “They weren’t just going on rides. They were trying to figure out how design thinking was applicable to Disney. They had to gather as much secondary and primary data as they could when they were there,” said DiLorenzo. For Fordham College at Rose Hill senior Nicole Berni, the trip was an opportunity to see in a very different light a place she has visited, by her own estimate, 20 times. Berni, an international political economy major who is minoring in marketing at the Gabelli School, was drawn to the course by the Disney connection and came away with an appreciation for design thinking. “What I really enjoyed about it is, it’s not just ‘Let me sell you something for the sake of selling you something,’ but ‘Let me think of you as an individual person, and what can I do to create the most utility and the most happiness?’” she said. 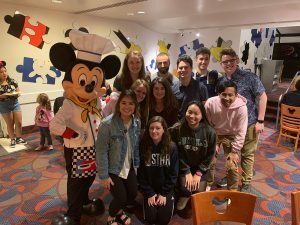 Students took classes taught by Disney employees on culture, teamwork, leadership, and design thinking. 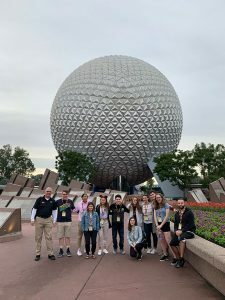 With Sklar’s 10 commandments serving as their framework, students were tasked with identifying something at each of the Disney parks deserving of a “Mouscar,” which is the company’s in-house award (think mouse plus Oscar). They also had to identify something that deserved a “Goof” (the opposite of a Mouscar), and then suggest improvements. Their final paper for the class will be their plan for improvements. Berni and her partner took the commandment “Keep it up. Maintain it. Keep it relevant.” and applied it to the Grand Fiesta Tour at Epcot. “It’s a fun enough ride, but we’re going to take something new, running off the movie Coco, and create a new ride that gives more modern relevance to the pavilion,” she said. Jacklyn Onody, a junior at the Gabelli School majoring in business administration, and her partner, trained their sights on Spaceship Earth, also at Epcot. The ride showcases technological improvements over the years, but stops short of the most recent innovations, she said. “We’re hoping to incorporate virtual reality and artificial intelligence into it to make it more fun, but also educational at the same time. Epcot is due to undergo renovations, so we thought this would be a good renovation,” she said. The students didn’t just wander around the public areas of the park during their time. Keys to the Kingdom, a five-hour behind-the-scenes tour, took them into the underground “Utilidor” tunnels that allow people and supplies to travel unseen beneath the park. They also attended classes taught by Disney employees on culture, teamwork, leadership, and design thinking. Greer Jason-DiBartolo, Ph.D., associate dean for academic administration at Gabelli, said the latter was what drew her to propose the visit to DiLorenzo. Design thinking piqued her interest, she said, in conversations at conferences for AshokaU, the consortium of schools dedicated to fostering social good and strengthening society that Fordham joined in 2014. “Social innovation is a differentiator for us, and design thinking is a tool used by social innovators, so I thought we should really expose as many students as possible to this,” she said. Although Jason-DiBartolo joked that looking at the parks in such an intensely analytical way kind of ruined Disney for her, Berni said she was unfazed, even after seeing “Mary Poppins” taking a break in the Utilidor. She’s applying to an internship at the park, and hopes to work there upon graduation. At Fordham, she’s involved in programming for senior week, so she said she appreciates all the work that goes on behind the scenes of a large production. “It makes it a little bit more magical, because the logical part of me knows everything that goes into making this happen, and yet they’re still able to make it happen, and to deliver it with the consistency and scale that they do,” she said.